- Señalar algo. Apuntar (con el dedo, con indicaciones...) a alguien o a algo. 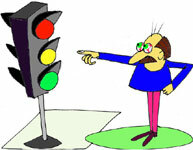 - He pointed out the fact that the traffic light was red. - There are a few mistakes in your test that I'd like to point out.